The UFC (Ultimate Fighting Champion) is taking their broadcast reach to a new level by showing the upcoming UFC 118 at movie theaters throughout the country. UFC 118 will feature the much anticipated rematch between Frankie Edgar and BJ Penn, and UFC legend Randy Couture vs. three-time boxing champion James Toney. This fight ticket is sure to generate a record number of viewers for a UFC fight. No longer do you have to go to a bar, or watch the fights via pay per view from your home – now you’ll be able to head to the movie theater and watch the fights, truly, from a big screen – with big sound. 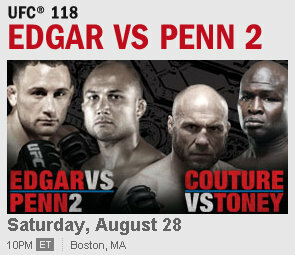 UFC 118 that will go down on Saturday, August 28 at 10:00 p.m. ET / 7:00 p.m. PT. Broadcast live from the TD Garden in Boston. And for the first time in UFC history, and in partnership with NCM Fathom, the fights will be shown live on the big screen of movie theaters. “UFC 118, with the rematch between Frankie Edgar and BJ Penn, and UFC legend Randy Couture and three-time boxing champion James Toney, is going to look and sound amazing on the big screen in theaters,” said Dana White, UFC President. You can purchase tickets for the movie theaters at www.FathomEvents.com. AMC Entertainment Inc., Celebration! Cinema, Cinemark USA Inc., Clearview Cinemas, Cobb Theatres, Kerasotes Showplace Theatres, National Amusements, Rave Motion Pictures and Regal Entertainment Group movie theaters, as well as The Arlington Theatre (Santa Barbara, CA), Carolina Theatre (Asheville, NC), Palace Cinema 9 (South Burlington, VT) and Penn Cinema (Lititz, PA), through NCM’s exclusive Digital Broadcast Network – North America’s largest cinema broadcast network. You can watch UFC 118 live online via Twitter.